Jon, freshly equipped with his very own climbing gear, wanted to hike up to the Caves in Sunol and climb. Cami & Crew and Nana and Papa joined us--we had individually made identical plans for the day, so we thought we'd just meet up and play together. We all enjoyed exploring the caves around the formations and also taking a turn climbing up the 5.8 route. It was a blast!! Jon Belaying and offering advice to climber Ansel. And flexability all in one: Remi! Dawna is our climbing nut. She loves being tied in and going up! He made it to the top too! On Wednesday, we had our family dinner of tri-tip steak, sour dough bread, Jell-o, and of course, cheesecake for dessert! Opening presents! The kids all wanted to help! Jade's favorite part was the wrapping! After dinner and dessert, Nana and Papa came over to put the kids in bed while Jon and I went to City Beach to climb! We had an awesome evening out together and came home to an Immaculately clean kitchen! Birthday bonus from our babysitter!! 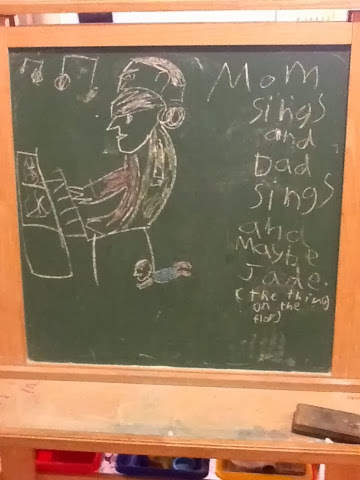 In case you can't quite see, the caption reads "Mom sings and Dad sings and maybe Jade (the thing on the floor)"
1. Larry biked 3 miles to a friend's house! Jade rode in the bike trailer for the first time, and Xochitl, sitting in June trailer next to her, put her to sleep! It was a fantastic ride! 2. We went climbing in Sunol last Saturday ( lots of pictures on google+) Xochitl almost lost her shoe down a narrow crevice, but I did some awesome shimmying down and squeezing and retrieved it! Go me! 4. Jon got to drive a Prius. It was not ours. 6. Jade learned how to click her tongue and does so incessantly upon waking. Very cute. And looking ahead, Jon is turning 31 this week... Woah. He appears to be dying... 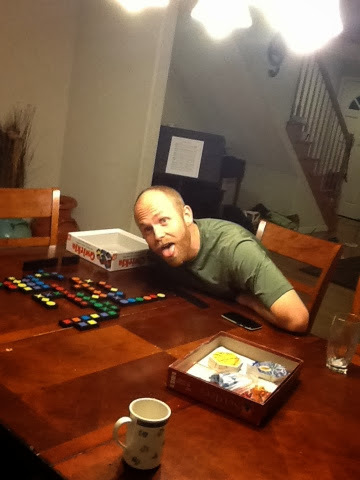 But at least he's winning at Qwirkle. Lynn is here playing also, but he didn't quite fit In the shot... The Blooger app camera extension also leaves something to be desired... At least we have Monday off! Happy MLK day!